Welcome to our modding community for STAR TREK: The Next Generation® Birth of the Federation is the first PC CD-ROM strategy game based on the rich STAR TREK universe! Control one of five major alliances: Federation, Klingon, Romulan, Ferengi, or Cardassian, each with its own set of abilities, strengths, and weaknesses. Encounter over 30 exotic races. And beware, there lurks the potential for a Borg invasion — threatening ALL players! 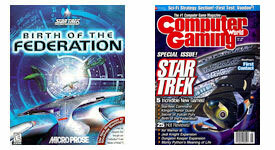 You will find many complete conversions with new models that add new major races like the Borg and the Dominion. We have also created gui changes that raise the resolution to 1024 x 768 and 1366 x 768 (wide screen). We have members working on replacement of the 3D engine as well as some total recoding of the game. Have fun, and hope you enjoy our site.